If you are a night angler and are looking for an affordable, compact and lighted backpack, then the Wild River Tackle Tek lighted backpack is for you. This fishing backpack has a led lighting system so you can see inside the backpack when it’s dark. The light also shines on the outside so you can see around the backpack where you are working. The Tackle Tek lighted backpack comes with many features that you usually don’t get in a compact tackle backpack. 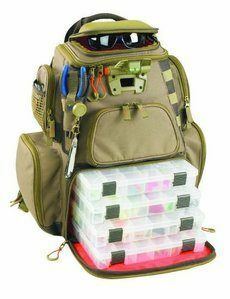 For example, this backpack comes with four PT3600 tackle trays and a hard plastic holder for your glasses. It also comes with a removable pliers holder that clips to your belt so that you have your pliers right where you need them when you need them. The front pocket cover folds down for a convenient working surface. The Tackle Tek also has a rain cover that you can quickly pull over the backpack to keep your fishing tackle safe from the elements. It’s an all-around handy tackle backpack to bring along to your fishing excursions. 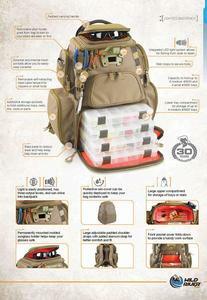 A Well Designed Backpack Makes Organization of Your Tackle a Snap! The Wild River tackle backpack is well designed with many compartments and pockets that help you keep your tackle and fishing gear organized. It has four side pockets, one big open upper storage area, and a large bottom storage area that holds four PT #3600 tackle trays. You get a work surface by folding down the front pocket so you can tie your jigs, lay out your lures and sinkers or whatever you need to do to get ready for the fish. This backpack also has open storage that is easily accessible from the front which is nice when you need to grab something quickly. Just unzip, grab and off you go. You can keep your fishing sunglasses safe with a permanently mounted glasses holder. It has a handy rain cover to keep all your tackle and gear dry when the weather turns rainy. I can’t count how many times I have been out fishing and it started to rain soaking my backpack and water would fill up in all the outer pockets making a total mess of things. You get all that with this fishing backpack plus a handy dandy pliers holder that is removable, and you can clip it right to your belt. So, organization is not a problem with this tackle backpack. Retractable Laynard is removable and useful for clipping your keys or other items that you don’t want to get lost. Web Loops to help secure any fishing tools and gadgets you might have. Plier Holder that’s removable and clips right on your belt for which makes your pliers easily accessible when you need them. Mesh Pockets so you can grab those essential fishing tools without having to look in each pocket to find what you are looking for. Clear Pocket that zips shut to put your fishing license in so that its visible and keeps it dry. Shoulder Straps are adjustable and padded. 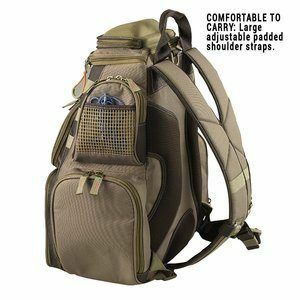 This helps make that backpack comfortable to carry if you are hiking for long distances. Sternum Strap adds extra support when carrying. LED Light System illuminated the inside as well as the outside when your fishing at night or if it’s a dark cloudy day. Rain Cover is handy to have when it starts raining it keeps all your tackle and fishing gear dry and protected. 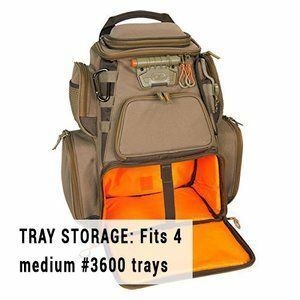 Four Storage Trays come with the Wild River Tackle Tek backpack. These are Plano tackle trays medium #3600. The trays are great for organizing all your jigs, lures, bobbers and sinkers. Find what you need easily and accessible. I recommend the Wild River Tackle Backpack for those of you who love to hike to where you are going to fish and if you are fishing at night. The built-in LED system gives you ample light to work with inside and outside of the backpack. There is plenty of storage and pockets so that you can have everything you need to have a successful fishing trip all in a compact bag. The padded shoulder straps and sternum strap make this tackle backpack comfortable to carry long distances. The four Plano tackle trays make it easy to organize your tackle anyway you see fit so you can find the exact jig or lure you need quickly. 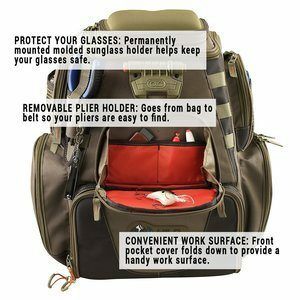 And with all the little extras that come with this backpack like the removable plier’s holder, the fishing sunglasses holder, the rain cover, the retractable lanyard, and the web loops you can’t go wrong with this backpack. I recommend you get yours today before your next fishing outing. If you have any questions or comments, please feel free to leave them below. I hope this review of the Wild River Tackle Backpack helps you make an informed purchasing decision. Thanks for reading and Happy Fishing! Previous Post Walleye Ice Fishing Tips – 5 Proven Tips That Work! Next Post Largemouth Bass Fishing Tips – 8 Tips That Will Get You More Bass!